The Packaging Shelf Life test is a real-time evaluation of a material’s sterile barrier. It is used to demonstrate that wraps will maintain a sterile barrier over time and complies with the Association of Operating Room Nurses (AORN) standard. Nelson Labs has more than 25 years of experience performing this test, and we can help clients prepare for the test and act on the results. Sterilization validations and penetration studies should be completed prior to shelf life testing to establish the sterilization cycle parameters. The Packaging Shelf Life study is designed to simulate the use of the products in a hospital or clinical situation. Test packs are prepared by the lab according to sponsor specifications and placed on the shelf for the designated storage interval. Typical storage intervals are 30, 60, 90, 180, and 365 days. 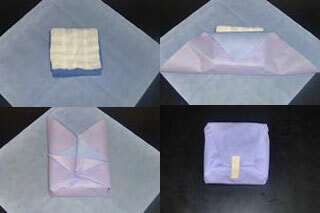 A typical pack consists of a sterile barrier system (wrap, tray, pouch, etc.) that contains a product (actual product, mock product, coupons, or gauze). Biological and chemical indicators (BIs and CIs) are typically included to verify that the packs were adequately sterilized. Our shelf life procedures integrate weekly handling and rotation in addition to the normal post-sterilization handling transfer to the storage shelves. All shelf life packs are stored on open wire shelves, which permit the highest levels of microbial fallout. The cleanliness of the environment is monitored weekly using both passive (fallout) and active (Anderson sampler) collection techniques. Temperature and relative humidity (RH) are recorded weekly to provide full environmental storage records. After the designated storage interval, the packs are transferred to our sterility suite where the contents are tested using traditional USP sterility parameters. Packs with actual product are tested in the same manner as routine lot release samples. Samples with mock product or coupons are generally subdivided into quadrants with some quadrants tested in SCDB and some in THIO. Recommended replicates: The number of packs to test at each storage interval is left to the discretion of the sponsor. Historically, sets of 3 to 30 have been tested. We recommend preapproving the test plan, including the number of samples, with the FDA prior to test initiation. If you have additional questions about Packaging Shelf Life testing services, or would like to consult with the experts at Nelson Labs, just send us a request or call us at +1 (801) 290-7500.